Featuring wave milgrain detailing and eleven diamonds totalling 0.15ct, this 9ct white gold ring is effortlessy stylish and distinctive. An enchanting wedding ring to symbolise the start of your new life together. 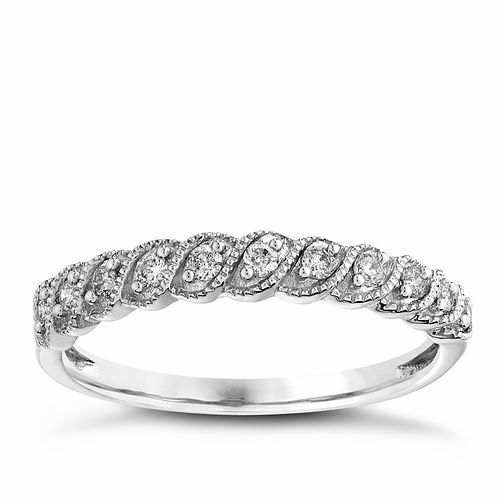 9ct white gold 0.15CT diamond milgrain ring is rated 5.0 out of 5 by 2. Rated 5 out of 5 by Anonymous from Alternative engagement ring We chose this for my engagement ring and I now wear it with my plain, white gold, 2mm wedding band. I love it! Rated 5 out of 5 by Anonymous from My Wedding Ring... I am upset I can't wear this until the wedding, it is perfect!